For the first stage of the program, all existing Google Voice users will have three invites each via a link under the Google Voice Inbox. Google said this would slowly increase. Apparently, it’s going to work the same way as GMAIL accounts a few years back. Similar to the best email addresses on GMAIL, the best phone #s I’m sure will go fast so now is the time to start sending out emails to friends/family to secure your invite to the service! Granted, I don’t think these will be as hot as a Google Wave account. However, I think, in the end, they will become more useful. Between groovyDexter and I, we should have 6 Invites (at least.) If you want one, drop your email address in the comments field below along with a groovy story. I deserve this because I’m a faithfull reader AND, i’m the first to ask!!!! Not sure if you have any left, but I could really use one for my new business venture. It would be much appreciated! I DO have invites left. I’ll send you an email to confirm the email address you posted on this comment. Thanks for the invite! Forgot to send the “thank you” email until today. Using it for the last week and it rocks! I’ve got Google Wave invites, will trade ya for a Google Voice Invite. SOLD – I’ll send you an email and we can do the SWAP. Thanks again for the Google Wave invite! Just received it and my account is now up and running! Do you guys by chance still have a invite left over for voice i have been waitng seems like for ever to get one but i guess google hates me :) if you have one i woul love to take it off your hands. Thanks again and love the site! I do. I’ll send you an email to confirm the address. Congrats! Yes we do. I just sent you an email to confirm the email address and that you do still need an invite. Got my invite! Thank you very much! Wave invites headin’ your way when available! Yeah it’s pretty good. It has a lot of good Use Cases! I would LOVE a Google Voice invite…thanks for the consideration…and, cool site, I just subscribed! Your in luck! I still have more invites. I will send you an email to confirm the one on this comment is accurate. Just reply to it and I’ll shoot you the invite! Unlike Google wave, the invite usually comes over immediately. – Congrats! You're AWESOME…I got it & it's all set up! Thanks again! Hi, I was wondering whether you have any more Google Voice invites left? Thanks, by the way, for the informative in-depth posts about Google Voice! Hello I see this has been out for a while but if you have any invites left or the limit has increased please offer me one. I would greatly appreciate it!!!! Hi Indranild – Congrats! I do have a few left! I'll send you an email to confirm the address above. Thank you so so so so much for the invite! It's set up and running! :D It looks awesome! 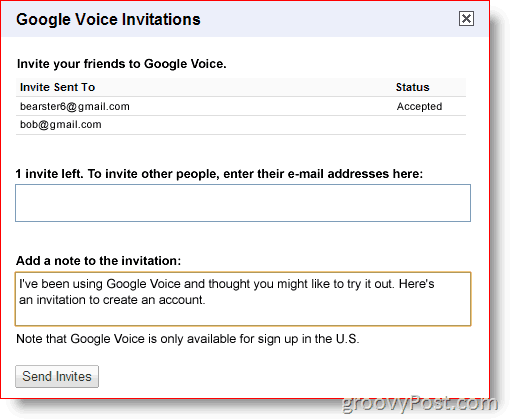 would love to try out google voice, do you have any invites left? great site. The invites went fast. Any other readers have invites? My wife and I recently moved to AZ from IL and are both currently unemployed. Out cell phones (AT&T) work fine EXCEPT at home where we have zero bars of service. I have been looking for a free VOIP service so we keep in touch with family and friends we left behind in IL. I have signed up with Google for an invitation but if you could spare a Google Voice invite it be a great help. PS, I am a new subscriber to your newsletter and love it. Thank you. however a few other readers might have one they can send your way. readers active in ther who might be able to assist ya. If anyone has any voice invites i'd be more than happy to trade a wave invite for one. Moving forward. If you need a Google Voice invite. Please goto this link. 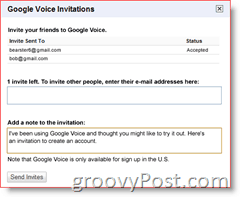 READ THE POST and follow the rules for a google voice invite!